(a) What is the focal length of a magnifying glass that produces a magnification of 3.00 when held 5.00 cm from an object, such as a rare coin? (b) Calculate the power of the magnifier in diopters. (c) Discuss how this power compares to those for store-bought reading glasses (typically 1.0 to 4.0 D). Is the magnifier’s power greater, and should it be? The magnifier's power is much greater than the power of store bought glasses. This is College Physics Answers with Shaun Dychko. We’re given the magnification and the object distance for this scenario with a magnifying glass. And the question is what is a focal length of the magnifying glass? So when the object distance is five centimeters magnification is 3.0 and we'll use the thin Lens equation which says the reciprocal of focal length equals one over object distance plus one over image distance and we don't know what the image distance is but we can make a substitution in terms of magnification and the object distance knowing this formula for magnification. 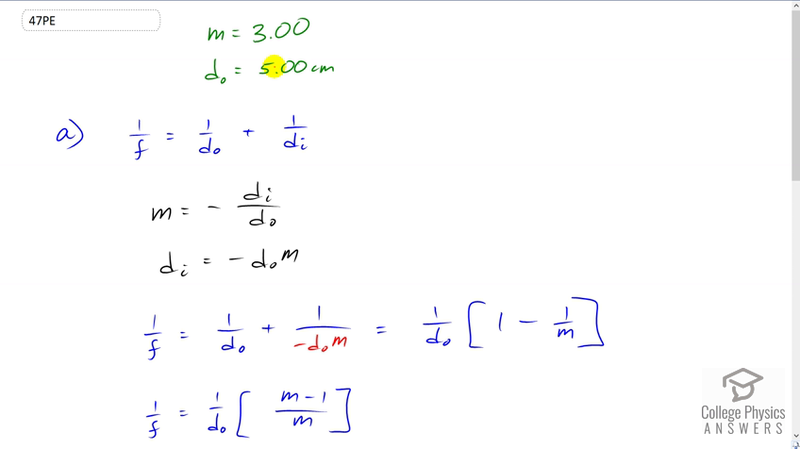 So magnification is the negative of image distance divided by object distance which we can then solve for di by multiplying both sides by negative do and we have imaged distance is negative object distance times magnification and this gives us something to substitute into the thin lens equation. And so we write that substitution in red here. So we have one over f equals one over object distance plus one over negative object distance times magnification. So one over object distance is a common factor which we factor out and then times by one minus one over m and then we can write this as a single fraction. You don't have to do this but that's the way I've decided to do it. So this is a multiply one by m over m which makes m minus one on the top and then a common denominator m on the bottom between these two terms. So then when we take the reciprocal of both sides since this has been written as a single fraction we can flip it and we get a formula for the focal length. It's the object distance times magnification divided by magnification minus one. So the focal length then is five centimeters object distance times magnification of three divided by three minus one which gives 7.50 centimeters as the focal length. The power of this magnifying glass would be the reciprocal the focal length written in meters. So that's one over seven and a half times ten to the minus two meters which is 13.3 diopters and this is much greater than the power of store bought glasses which has a power of between 1 and 4 diopters.